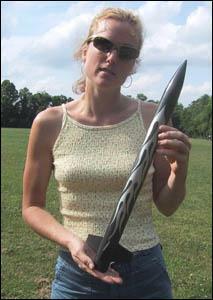 Essence's Model Rocketry Reviews is pleased to announce our 10th photo contest. 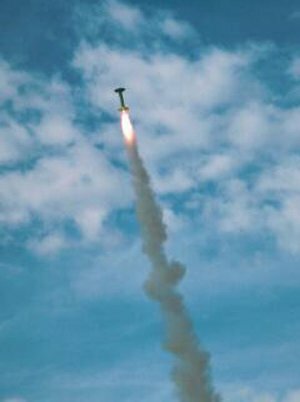 Looking through our previous contests, it occurred to me that we have excellent pictures (and takers) of static and lift-off pictures. 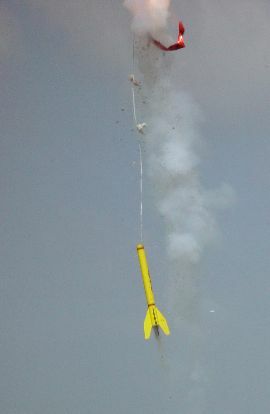 Now it is time to capture the rocket during air time. Yes, "Show Us the Blue" is your opportunity to capture a rocket, or rockets, in the air showing nothing but rocket and sky (we'd perfer blue sky, but we must take every opportunity). 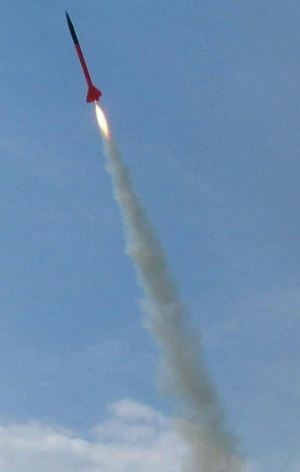 The rocket can be going up or coming down, with or without a parachute. Just don't get anything but rocket and sky in your picture. Winners will be judged by EMRR Guests during a voting week of July 12 - July 18, 2004. They will be looking for the most appealing picture to them. 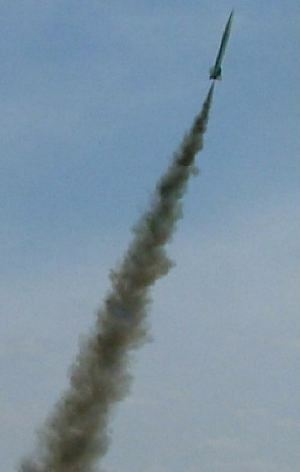 Entry photos must be two (2) photos with different launchers and different rockets. Contest is over on 7/11/2004. Online Voting will take place from 7/12 - 7/18. (1) copy of the Spaceship Handbook by Jack Hagerty and Jon C. Rogers, published by ARA Press. Over 100 Data Sheets on 75 different spacecraft. Larry Van Bussum's Mercury Redstone Liberty Bell 7 flies on a C6-7 at SpudRoc-9. Jamie Clay's Mercury Joe flying on a K670GG takes a wrong turn at XPRS-2. 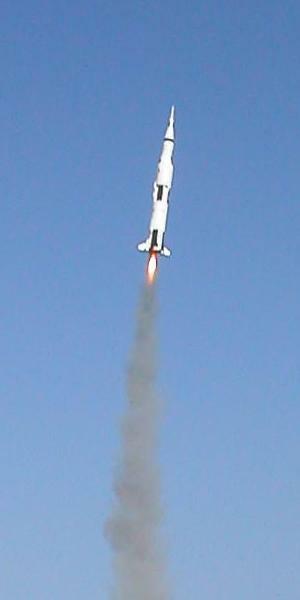 Saturn V - This scale Saturn V rocket is being launched at San Diego's Fiesta Island on an Aerotech F24-4 RMS motor. 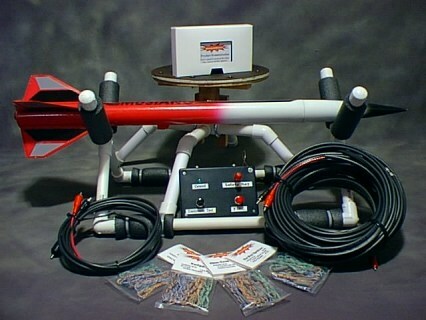 The Saturn V is an Estes kit with several upgrades to add strength and durability. 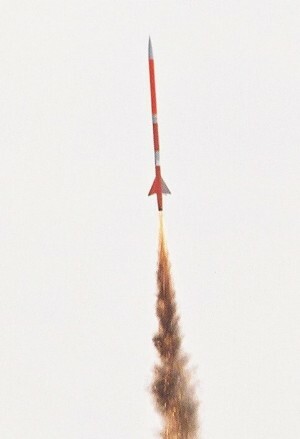 After this windy flight, the nose section of the rocket "splashed down" in the bay, but was recovered without damage. 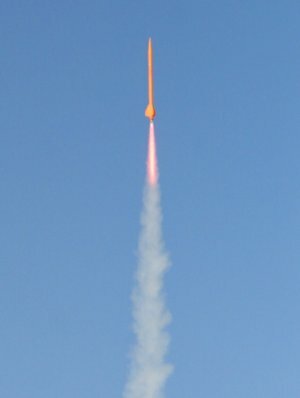 The rocket has now been successfully launched nine times with E and F motors. October 25, 2003. V2 CATO - This photo was taken at Plaster Blaster 2 in Plaster City, California. 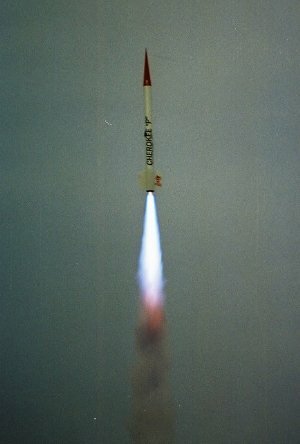 This large scale V2 was launched with an Aerotech M motor that decided to fly on its own out through the nose of the rocket. The incident occurred about 200 feet of the ground. October 4, 2003. 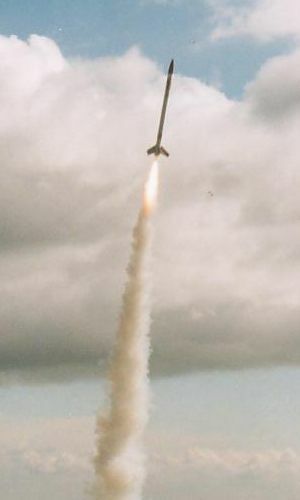 Estes Tomcat under power on a C6-3. Perfect flight. 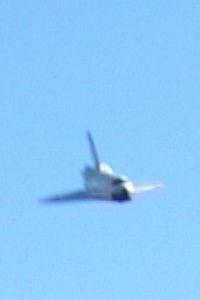 Space Shuttle gliding back. Looks so realistic! An invader from outer space, aka. 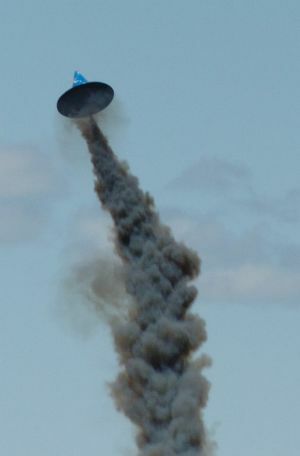 Quests Flying Saucer, is leaving our planet Earth. As always: nice but low flight. Soft landing in high grass. 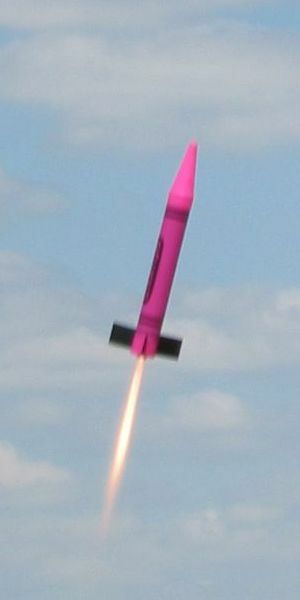 The Estes Cluster-Bomb on its mission to fight the evil in the world. 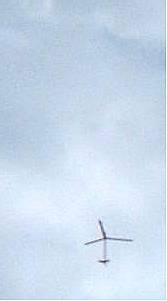 Slow lift-off and a nice straight flight on a C6-3 to an altitude of 120 meters, save recovery. Scratch-built 2.6" Patriot lifting off at the July 27, 2003 CMASS launch. It takes a cluster of two D12-5's and two D11-P's. 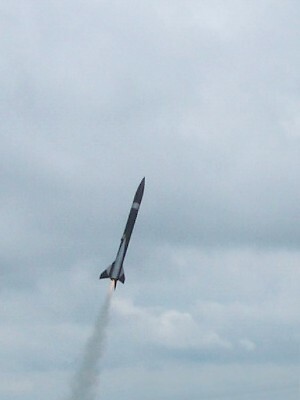 One of the D11's CATO'ed right at liftoff. 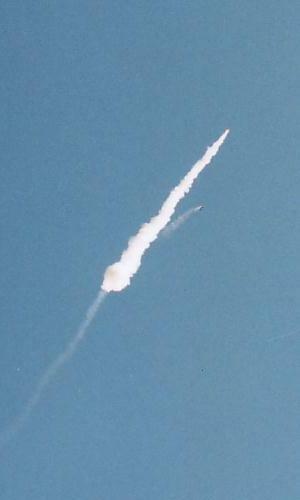 The white smoke tracks are from burning chunks of propellant. Despite some damage, the Patriot had a good flight and was recovered successfully! Ancient and much-repaired Custom Landviper lifting off on a cluster of three C6-7's. It always puts in a good flight! Photo was taken at CMASS in July of 2002. Despite the high flight, both ground and high altitude winds were nearly nonexistent that day. The Landviper was recovered within 100 feet of the pads! Cherokee "P" project of Tripoli Vegas heads toward the cloudy sky's in Jean , NV. 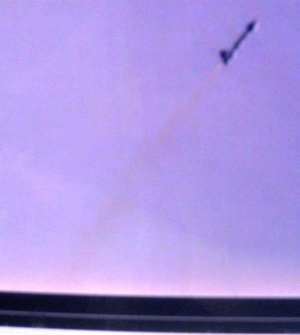 Premature airframe separation caused a shorter ending to the flight. Motor was a Nassa blue P8700. Total length of Cherokee was 16 feet and weighted 171lbs, all electronics was damaged ( (4) altimeters and (1) video Camera. 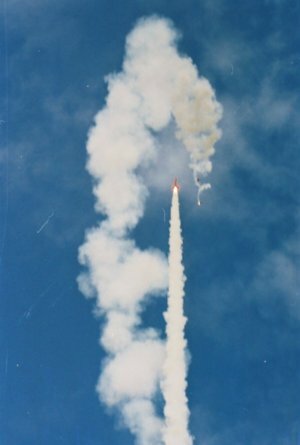 It was a Level 3 drag race at TurkeyShoot 2003, between Black Pearl,( shown spiraling down, but lived to fly another day ) and GravityKills ( My Red rocket, passing thru Black Pearls remains, looks to be a lucky fly-by. 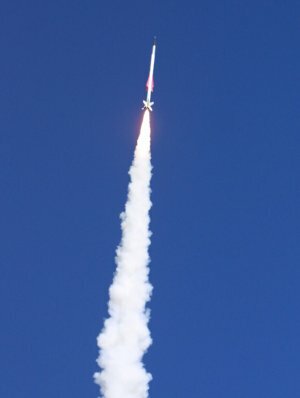 Both rockets were using a AT M1315 and GravityKills was successful and recorded a 6700 foot flight and earned my L3 cert. 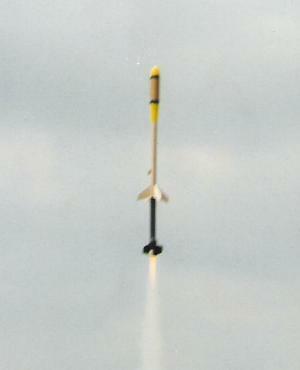 Wizocket - Flown at FITS 2004, in Mansfield, Wa. 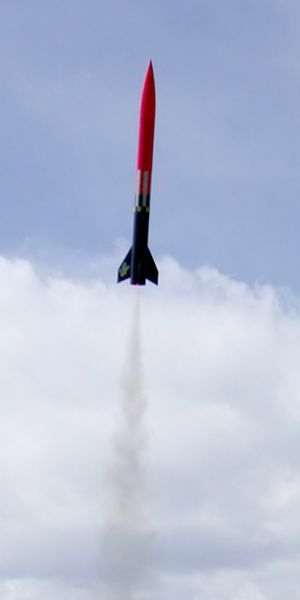 on a CTI J380SS (3Grain 54mm) with a 6 second delay (smallest possible with this motor) in a modified SkunkWorksRocketry (now PolecatAerospace) "Woket" - RockSim predicted altitude ~1700 feet, actual using a PICO altimeter 402 feet. The hard landing merely got it dirty! 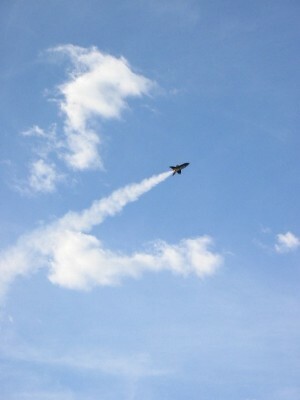 Estes "The Dude" - D12-3, always a beautiful flight, low and slow. Pretty great for 7' balloon! 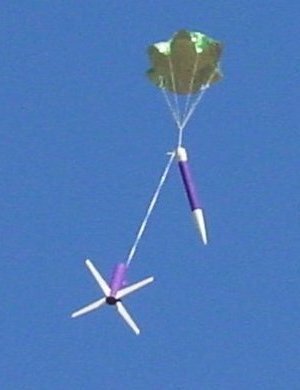 This is the porta-potie that was flown at LDRS '03. It flew on two M1939's and this picture is as it is going towards the ground. This flight was at ROCstock in June of '03. 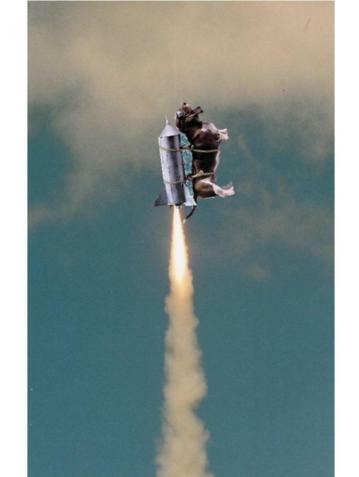 The rocket'sname is something to the effect of "Nibbles the Flying Space Cat." 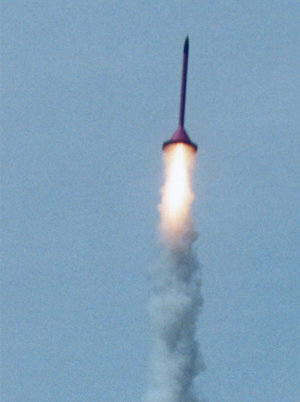 It was designed to fly on a central M1315 with 4 sets of air-starts during the flight. 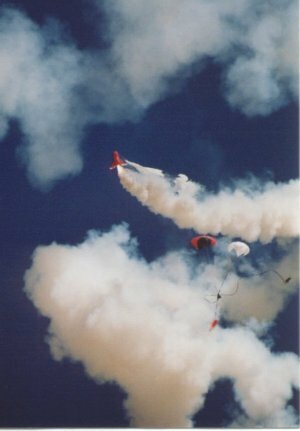 The air-starts were late and the parachutes ejected prior to the air-starts. 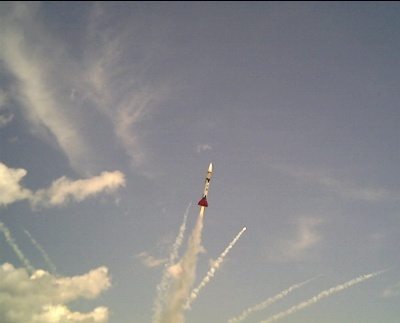 This is the 3rd set and the rocket has just speard one of the 15 foot chutes. 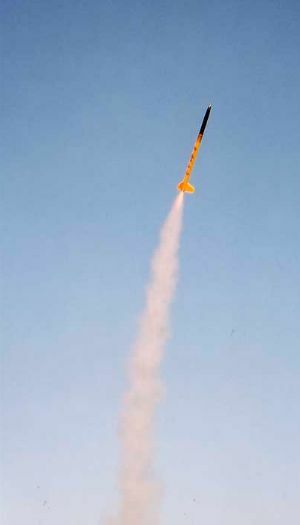 Ady Water's "Hell Fire", scratch built, minimum diameter on a Pro38 Smoky Sam - probably an H at EARS October 2003 Launch Mike Hoffman's woefully underpowered (and heavily overbuilt) Big Daddy on a C6-5. 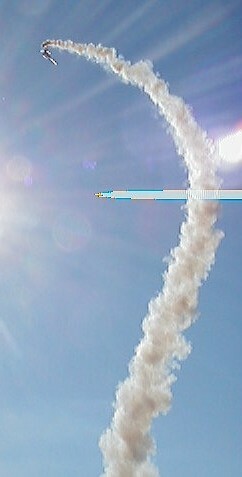 A very entertaining flight, apogee and burnout were simultaneous, ejection on the ground. As always, it survived to fly again! The first picture is called "SeeSpotFly" No actual live dogs were used in this original yet creative design. Spot is flying on an A/T-M1850 and the flight was a smashing success. We repeat, no dogs were harmed during this flight! The second picture is Rick Boyette's Naboo Fighter which was a converted store display and is flying (or trying to anyway) on a J350. It stands about 6 feet tall with a 5 foot wingspan. It corkscrewed and bellyflopped. 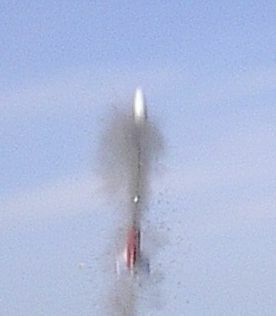 Fat-Boy-Cato: 29mm Fat Boy on an AT G64W about 10 feet off the pad. CATO!! First, last and only flight of this Tiny Pterodactyl on an AT G64. A gust of wind, a bit of rod whip and it was off at about a 45 degree angle. Still hiding in the scrub at Brothers, OR. 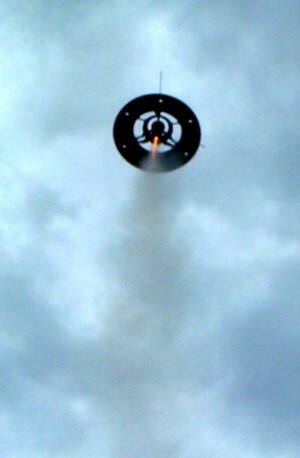 My Estes Sky Winder spinning back to a safe touchdown from a boost on a B6-2. 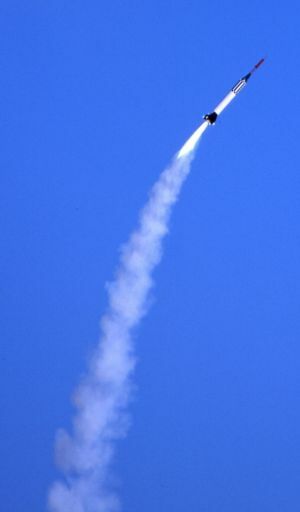 Four low power rockets drag racing at the Tripoli San Diego 04/03/04 launch. I can't believe I caught all four of such varied rockets in the air! Astrobee D on a G40-4W at CRASH group launch in Lakewood, CO. Great flight, great landing. My Aerotech G-Force on a G80-4. 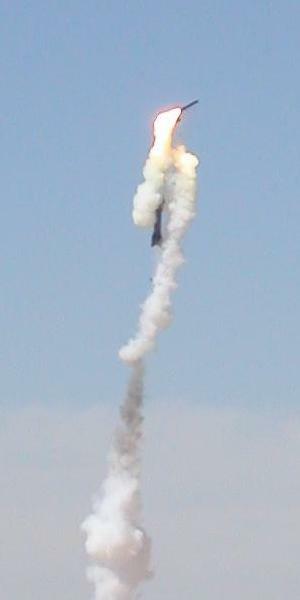 Slow takeoff was dramatic but chute tangled on ejection. Hit hard but no damage at all. 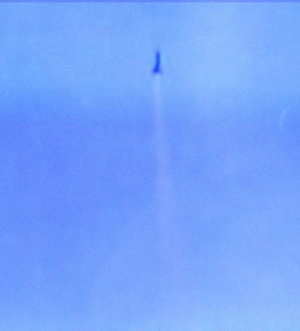 International Rocket Week, 2002: The second stage ignition of the "J570W" Aerotech motor in the Upscale 8" Delta Clipper, flying on a booster of a K1100. 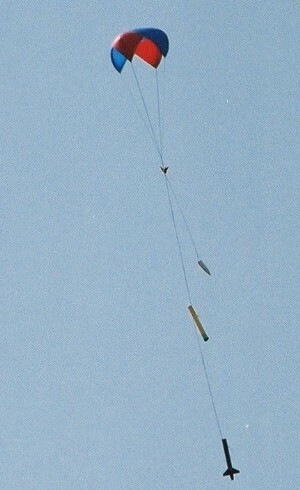 An excellent flight to ~9000ft with recovery of both sustainer and booster, both using dual deployment. 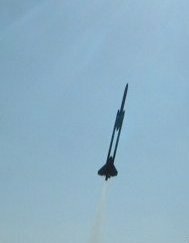 International Rocket Week, 2002: The takeoff of the single staged Upscale 8" Estes Thunderhawk, flying on a J570W Aerotech motor to a successful flight with Dual Deployment. 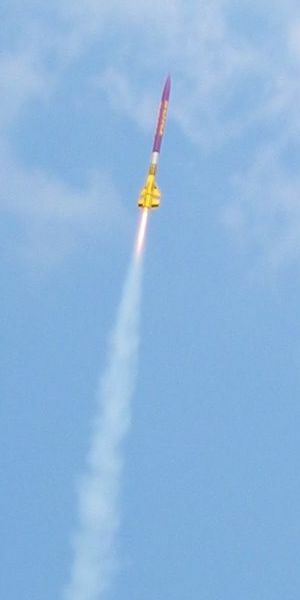 My Estes 2.6 inch V2, flown at NARAM 45 on an F21-6, perfect flight and recovery My Fliskits Deuces Wild, flown at the February 2004 BluesRocks launch in Elizabethtown, KY, on two C6-5's for a perfect flight and recovery. Quest Superbird lifting off on a C6-5 on a sunny day. 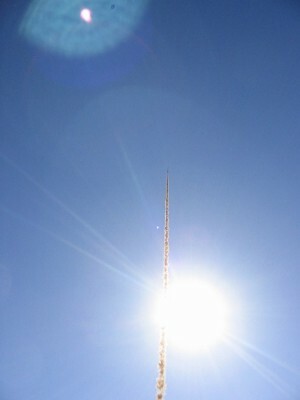 The rocket was barely 50 feet off the pad when I got this picture. 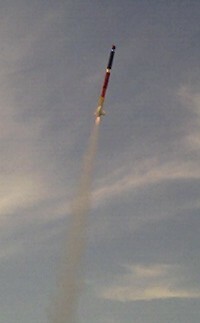 This flight was perfect and the rocket was recovered very close to the pad. 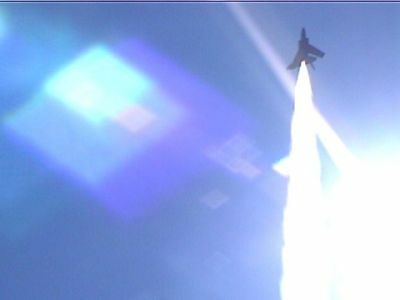 Estes Baby Bertha + Estes GBU24 Paveway III dragging racing on B6-4s. Pic was taken just before the end of the boost phase. 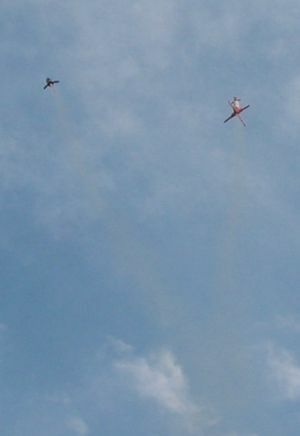 These rockets crossed paths in flight as you can see from the smoke trails. 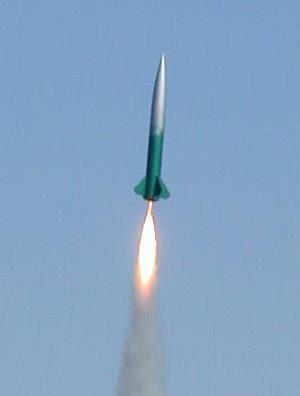 The Baby Bertha just barely made it to a higher apogee before the chutes came out. 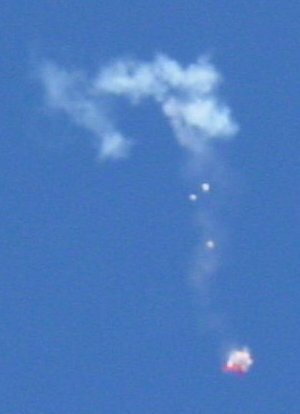 Both rockets recovered less than 50 feet apart. Sorry, don't have much info on this. The engine is an A1000 Skidmark at NSL Hearne, TX 5/29/04. I swear that's a sky background (very cloudy) Recovered successfully! I have even less info on this one. Taken at NSL Hearne, TX 5/29/04. 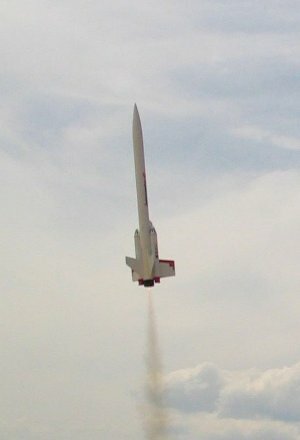 My scratch built funnel rocket flown on a AT J350. Weighs 4.5lbs with motor. 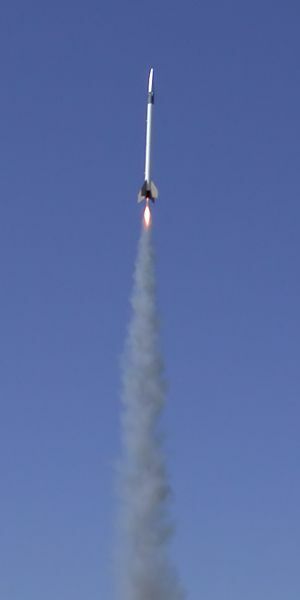 Extreme acceleration plus high drag equal an apogee of around 600 feet. A perfect flight that day. 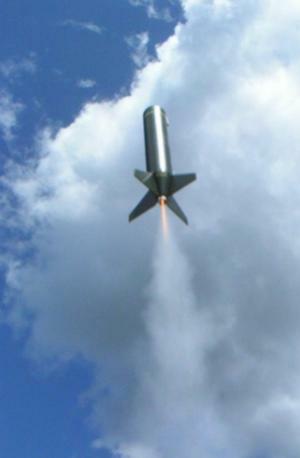 My scratch built spool rocket using an AT I211 for propulsion. Reached about 600 feet and landed safely. A great flight on a great day. QModeling MRS-WAC Corporal on a D12-5. Perfect flight. Estes Executioner on an E9-4. It was windy that day, so I angled it pretty hard into the wind. Chute got tangled and never opened, but landed on wet grass without a scratch. 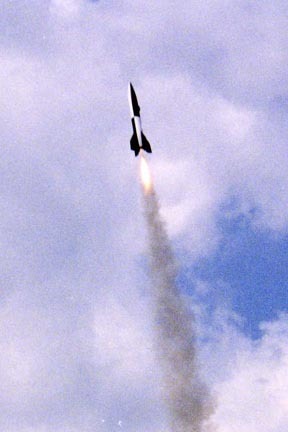 Vector hacia la Luna (Vector to the Moon); is a kit from Cóndor Tec from Argentina, that is 900 mm tall and 50 mm in diameter; and is impulse by a Cóndor Tec D15-4, and reach the apogee at 95 mt. This particulary model, flying 35th times yet; and it is more or less the fly number 29th. And of course was successfully. 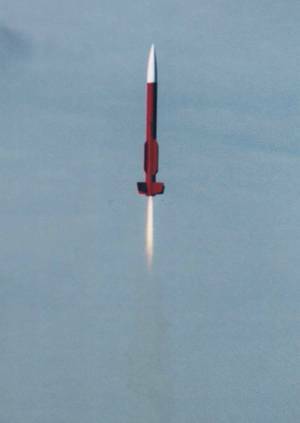 CT F9-4: is a model that have 1200 mm tall and a diameter of 50 mm; is impulse by a Cóndor Tec F9-4; and reach the apogee at 500 mt. 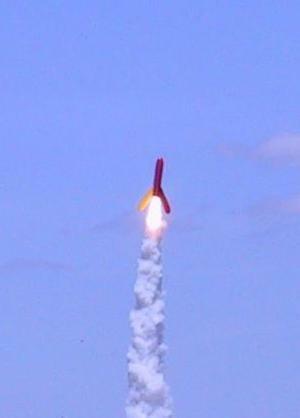 This model flying 7th times, and it is the last one happened the June 12th of 2004, with a successfully flight. 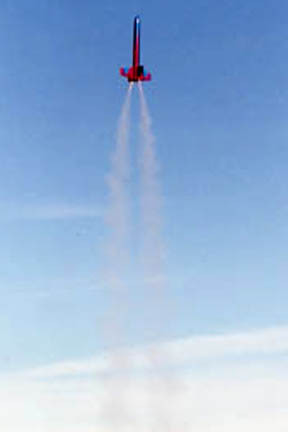 Quest SUPER EAGLE riding the sky on a C6-3 . 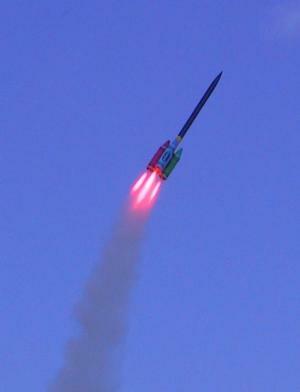 Good flight, save recovery, it launched to about 120 Meters. My self-constructed VENOM on the parachute. (It has nothing common with the Estes model, it's my tribute to the legendary British metal band). Flight was with a D7-3 from Sachsen Feuerwerk to 160 meters. Perfect flight and a safe recovery. SS-Arrow-L2 attempt on a beautiful no-wind day. 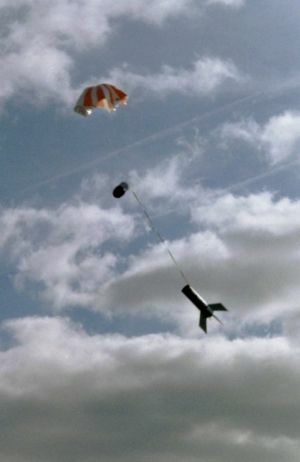 Cesaroni 5-grain (J285), Public Enemy's SS-Arrow, flew perfectly to an altitude of 2327 feet, and wound up landing less than 50 yards from the pad. The second certainly doesn't look like much until you hear what it is-a micromax-scaled Rota roc that actually flies and works. 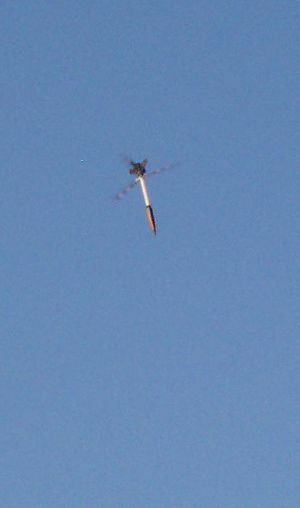 This particular shot captured the tiny little copter at apogee, roughly 150-175 feet, and the blades had just popped. About 3 out of 4 flights this comes down upside-down, but for this shot I actually got it coming down with full rotation, and a flight time of about a minute and a half! I plan on following up this fall with an upscale, which will be an attempt at the NAR G helicopter duration record. 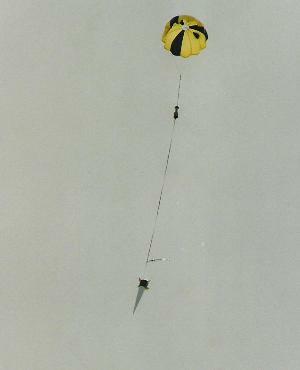 Fliskits Praetor recovering on a Mylar chute after going up on a C6-5. Successful recovery on this flight as always with this rocket. 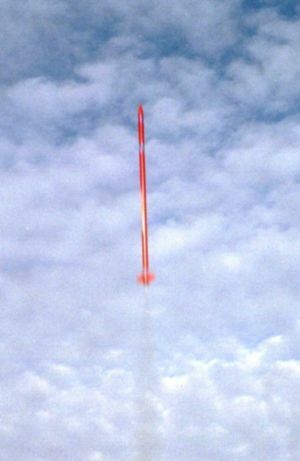 Estes Code Red with an Astrocam nose cone on it taken right as the ejection charge went off. 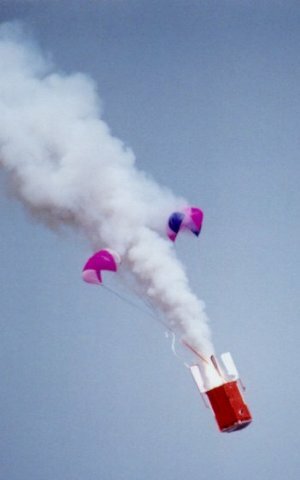 The chute is deployed but has not filled completely, 3 sheets of wadding are visible between the rocket and the ejection smoke. 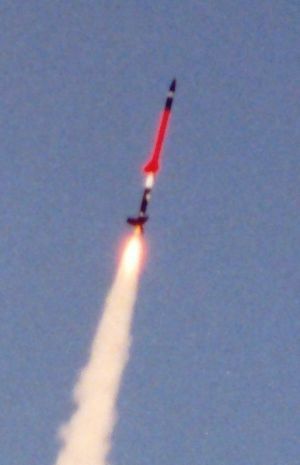 Successful recovery of the rocket but the picture from the Astrocam was to blurred to make anything out when developed. 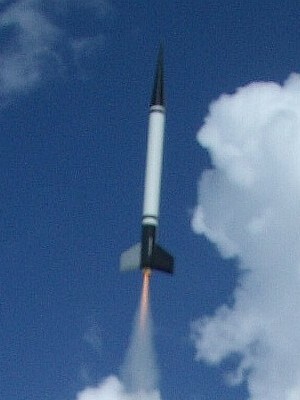 Rocket was launched on a C6-7. My stretched AT Mustang on an F25-6W. 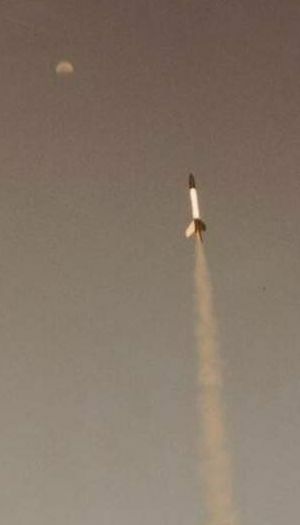 Altitude was 1287' (so says a Missile Works RCC2X altimeter), with perfect recovery on one of my own Maine Model and High Power Rocketry 22" parachutes Aerotech Warthog, motor unknown. Obviously a Black Max though. I believe recovery went without a hitch. Both pictures were taken at the CMASS launch on May 22nd. The Avenger is my own 1.9" scratch-built 2-stage, flying on an AT H180/H180 combo. 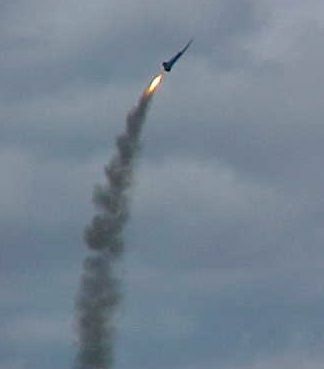 This photo was taken less than 0.5sec before sustainer ignition - the booster was still burning which made for a spectacular (if messy) separation. Flew to 5900' and both stages were recovered succesfully. The Sasin is Les Morton's 2.6" scratch-built with PML components and an Acme fin can. It's going up on an AT I300T. The flame was really bright blue, it's a bit washed out in the photo. Successfully recovered. The first is a picture taken by Bill Gee of my Alien Space Probe, edited by me to reveal the aliens identified on one of its flights. It landed straight up on its pods after a perfect flight on a C6-3. Unfortunately, I don't have a photo of that. The second is a picture taken by Nettie Hunsicker of a D12 cato in my Estes Big Bertha D-mod clone. Quest Courier: My Quest Courier on its most recent flight. It landed on the school w/ a scrambled egg. 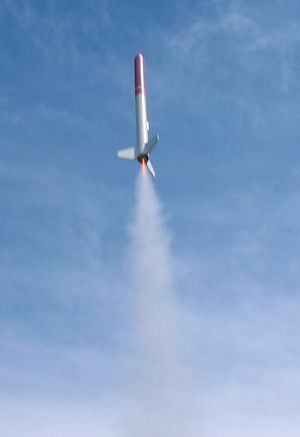 I got it back :-) Estes V2: Estes V2 on a perfect flight with a D12-3. And for once the 'chutes didn't tangle!